“Families.” Digital Image. Photographed by Richard O. Cheek, 8 June 2005. Privately held by Richard O. Cheek, Midwest City, OK, 2005. This was the very first album I remember my family buying that wasn’t a 78. I loved the music then and still like it just as much today. I have seen more productions than I can remember. Two of my sons played Curly in high school. I have seen it indoors and out. But I always remember the “Chicks and ducks and geese better scurry” line from that very first LP. While I have very eclectic taste in music, folk is my favorite. I got my first introduction to folk music from the Kingston Trio and have been hooked ever since. They did a lot of good stuff, but nothing better than this live performance from the Hungry i. Continuing the folk theme, Joan Baez is responsible for raising my awareness of the place of music in the fight for social justice. As a child of the 60s, I was never a big Dylan fan, but I loved his songs when sung by Joanie or Peter, Paul & Mary. How could I be a child of the 50s and 60s and not include a Elvis album, but which one? When in doubt, go with the first. I bought a lot more later, but this one started it all. And this from a boy who once helped form a “We Hate Elvis” Club. See what I said above about Joan Baez and the Kinston Trio. I really credit my wife’s sister Anne for introducing me to the best of all the folk groups. I know many of you would not choose Surfin Safari as one of the top Beach Boys albums, but it is the one that brought me into the fold. Of course, I still think they stole some of their concepts from Jan and Dean, but that’s another story. And yes, I think Pet Sounds is one of the greatest albums of all time. What more can I say, “Listen, do you want to know a secret . . .” This is the first album my college room mate bought for his brand new stereo in 1963. No folk song fan’s list of albums would be complete without at least one song from the Guthrie family and Alice’s Restaurant has long been a family favorite. This was actually a little past my teen years but definitely a big influence in my life. I think Simon and Garfunkel had the best sound of the 60s and early 70s. I was sad when Dave Guard left the Kingston Trio, I was upset when the Beatles broke up, I was ticked off when Dean Martin left Jerry Lewis, but I was devastated when Paul and Art parted ways. If I went to go on to my 20s and 30s it would include a lot of John Denver and Harry Chapin, but that will have to wait for another post. “When You Really Need A Friend.” Digital Image. Photographed by Richard O. Cheek, January 2008. Privately held by Richard O. Cheek, Midwest City, OK, 2008. 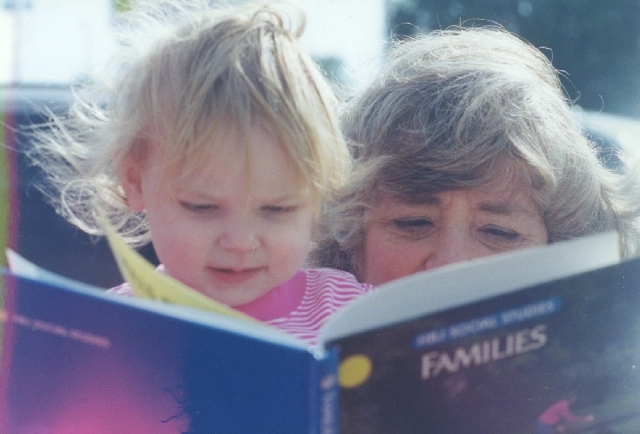 CURRENT USE DEFINITION of “genealogy method”: Method of investigative scholarship to establish valid generational relationships connecting any specialty, within or between all fields of knowledge. JUSTIFICATION: Genealogy Method procedures that discover and record connections of kinship, descent and marriage, can also be used to establish accurate understanding of any knowledge system properties, using diagrams, symbols and scholarly analysis. methodology, as it relates to the scientific method. Understand the evolutionary processes of industrials sectors using a genealogical perspective. Pardon this brief departure from the genea-games, but I need to rant a little. Men’s gymnastics has always been about power, but women’s gymnastics has been about style, grace, and skill, at least until this olympics. 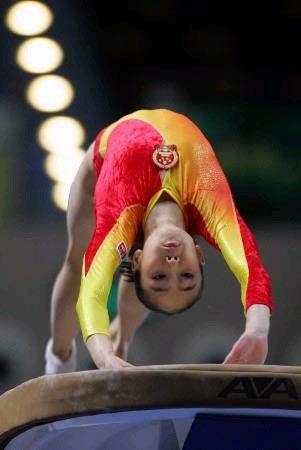 I never thought I would see the day when a gymnast who fell to her knees on landing would qualify for a medal. But the current scoring scheme, which was of course supposed to correct the problems associated with the old “perfect 10” scheme has also fallen far short of sticking the landing. Of course we already knew there was no such thing as justice in the gymnastics world after the last olympics. So China’s Cheng Fei got up off of her knees to accept the bronze medal, knocking Alicia Sacramone off of the medal stand in spite of the fact that she had performed to good vaults with a hop on the landings. Those hops which were deadly under the old scoring system were routine at this olympics. I think it only fitting the Cheng Fei should have to accept her medal on her knees. Day Two was pretty much a bust because of some serious family problems. I did manage to do two citations. I really got rolling on day three and did 52 getting all of my direct line with spouses and siblings fully documented and cited down to my grandfather Cheek. That brings my citation total to 64 which qualifies me for the platinum medal in category 1. Go Back and Cite Your Sources! In the process of documenting the records I added more than 20 entries to my database which qualifies for the bronze medal in category 3. Organize Your Research! The title of this has to have a disclaimer. It was a lot harder than I thought it would be to pick out one photograph as my favorite. So for the record the one below is my favorite right now (10:00 pm, 10 August 2008). Even after saying that I am including the 2nd place picture and will post several others that were considered in the near future. 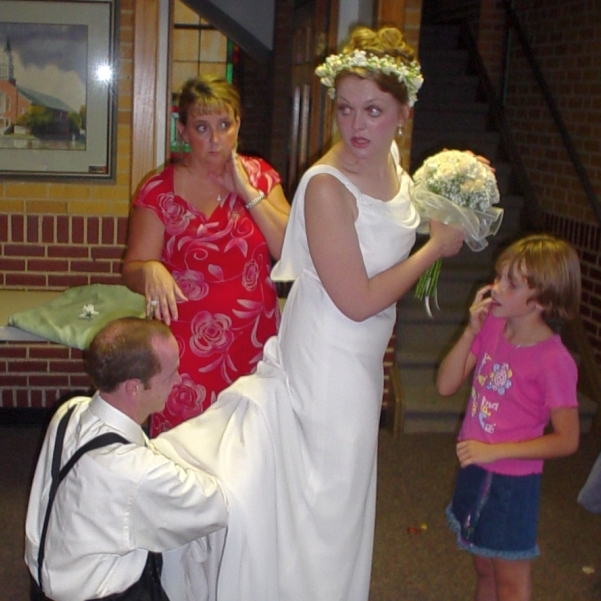 Taken August 27, 2004 in El Reno, OK at my son Rick’s wedding. It was be an “eye-catching” picture just from the content, but the expression on my daughter’s face in the background makes it priceless. This was the first wedding we had had in the family in thirteen years. It was in a beautiful, old Catholic church with an old, Irish priest presiding. Perhaps the most memorable part of the wedding experience was at the rehearsal when the priest said, (and I can’t reproduce the Irish brogue) “No matter what happens during the service tomorrow at the end of it you will be married. If you fall flat on your face as you walk down the aisle, just kiss the floor, say it was and act of contrition and get up and walk on.” Fortunately, no one fell on their face and most everything went as planned. It was afterward that I caught this picture. For those of you who can’t figure out what’s going on, it really is very innocent and they are newly married. The train of Erin’s wedding gown was made to hook up inside the skirt and her new husband Rick was the only way who knew how to fix it. The look of consternation on my daughter’s face is purely a coincidence that the camera just happened to catch. I don’t know if this fits in the rules since this is actually two pictures. 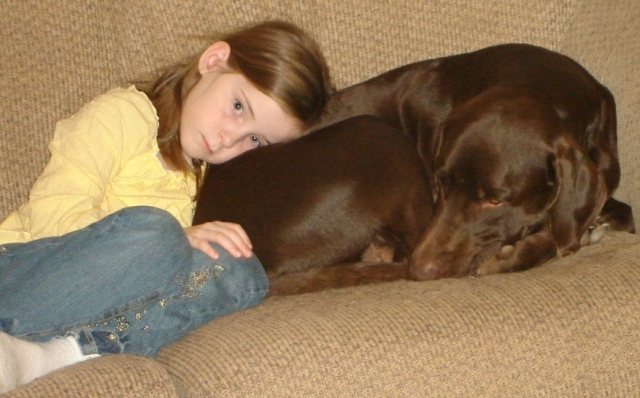 But they have always been an inseparable pair in our family. 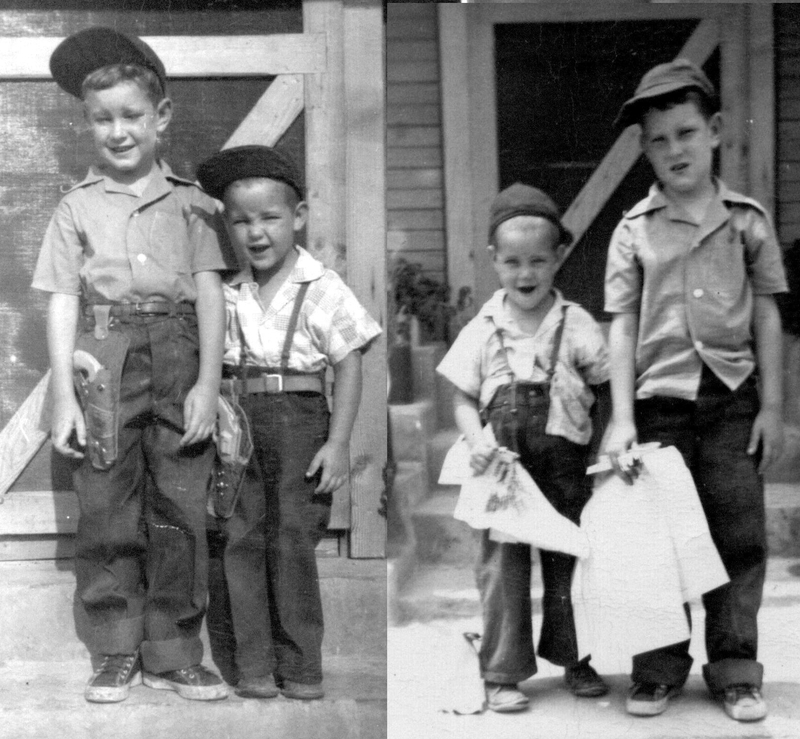 They are a before school shot on the left and an after school shot on the right of me and my brother, (he’s the tall one, I’m the cute one) taken in the Philippines in 1948. It has always been one of my favorites and a standard shot in our family to represent the way we were. My mother worked very hard to make sure we were always neatly dressed no matter what the occasion, and yet it never seemed to fail that as soon as we were out the door, all of her hard work was for naught.